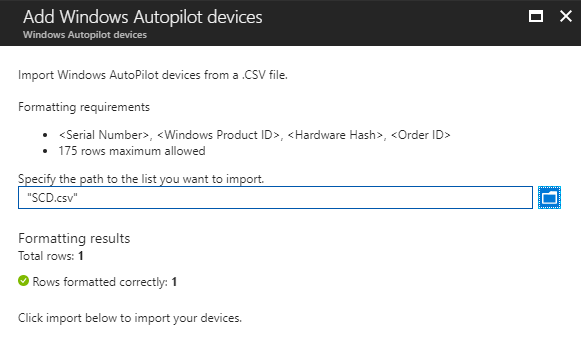 Windows Autopilot is a new and emerging solution designed that allows to setup and pre-configure Windows devices for your environment using Azure and Intune. The goal of Autopilot is to reduce the Os deployment complexity. 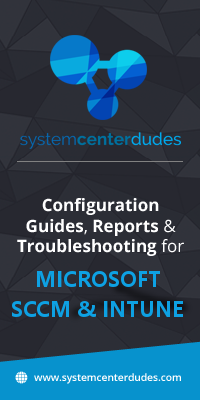 If done correctly, a user logs to an out-of-box computer, logs on his computers with his ADD user account and applications and configurations gets deployed. All that with minimum infrastructure requirements. When announced a couple of months ago, Autopilot has its flaws but it’s improving very fast. One of those flaws was that device importation was made from the Windows Store for Business or the Microsoft Partner Center. Those days are over since you can now import your device directly from Microsoft Intune. Update 2018/04/09 – Intune now uses the same format as the Microsoft Store for Business, so you can directly upload a CSV created by the Get-WindowsAutoPilotInfo script. From there, you need to select a .CSV file. It’s not possible to import a single device manually. This means that you need the Serial Number, Windows Product ID, Hardware Hash and Order ID separated by a comma. You cannot have more than 175 rows/devices in the CSV. Hopefully, there a good script is already available in Windows to get this information… but it’s not yet adapted for Microsoft Intune. The OrderID is not generated by the script so it needs to be added manually and the header is invalid. It will take a moment to show in your device list but will eventually appear. The device will also be visible from the Windows Store for Business portal. The device is now ready to use in an Autopilot deployment. I have found that when running this that no “Windows Product ID” is generated. is there a change required to the script for this? The “Order ID” is optional and arbitrary, as in, it can be anything. If added to the CSV, it is stored on the Azure AD object and can be used for filtering. Did you get any response on this as am in the same group with you. This was after the Importer identified 1 correctly formatted row. So I’m not sure what is going on there.. I got the same error message. In my case, my account has custom permissions in Intune. The import worked when I ran it using the Intune Admin account. Not sure what permission is required to import Window devices though. The need to modify the file was recently removed – Intune now uses the same format as the Microsoft Store for Business, so you can directly upload a CSV created by the Get-WindowsAutoPilotInfo script. Thank you for your update Michael. I’ll update the post. This is inaccurate. Simply running the script nd performing an import works. No need to modify file! Thanks a lot, this worked for me! Small question, what is the OrderID for, and does it need to increment?